It finally happened. 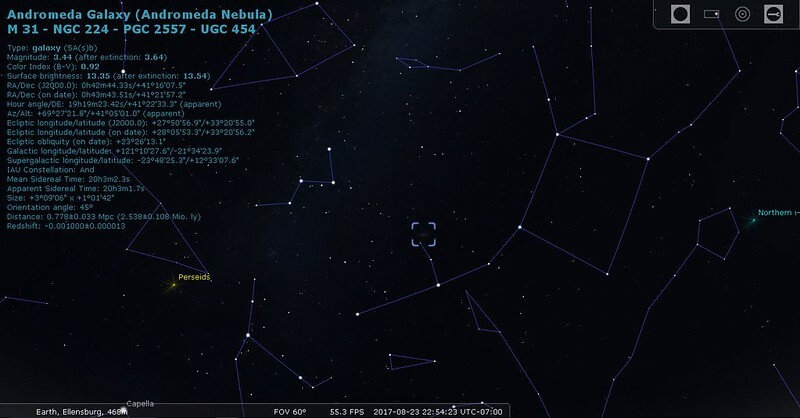 After many long years of seemingly inexhaustible patience, the culmination of astronomical glory passed instantaneously like a blip in time, and yet for that two minutes and nine seconds, time stood still. Without a firm plan, I filled my car with enough gas, food and water to go for days without stopping, and a 600mm f/4 lens with a solar filter strapped to a Canon 6D I purchased the week before. I set out on Saturday evening in the general direction of eastern Oregon, to organically find the armageddon that apparently awaited me. Night fell as I drove over the rolling hills of eastern Washington, the sky pitch black and speckled with millions of faints stars, on account of the moon’s absence. The next day, I came upon a peaceful spot along the gentle curves of the Snake River, as it hugged the Oregon-Idaho border, and decided to setup camp. Wispy clouds painted the sky, and I silently scorned their presence. 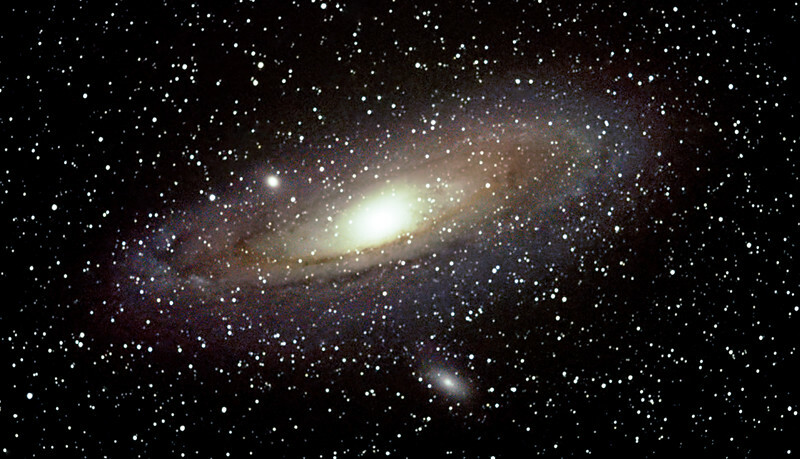 Sunday night was sleepless, in part due to excitement and last-minute planning, but maybe more to the fact that I was in possession of a 600mm lens and Andromeda was visible high in the night sky, thanks to late dissipation of the maligned cloud layer. Either way, the following morning, my tired eyes welcomed the sunrise, and I smiled as light poured across the landscape from a crystal clear sky, knowing the moon was quietly stalking the sun. The day had arrived. And I was ready. Early that morning, people began filtering into the surrounding areas en masse. My spot was secure though, and I waited patiently for the moon to encroach upon the sun. Following first contact, I watched as the moon covered each sunspot in sequence. The silhouette of the sun was gradually reduced to a crescent, the air temperature dropped and the quality of light dimmed to an eerie dusk. Darkness fell and a cold breeze chilled the dry summer air. I looked up to see the moon ablaze, surrounded by an enormous ring of purple-blue fire, black as night in the center. Stars dotted the deep blue sky, Regulus closely flanking the hiding sun. They tell me totality was two minutes and nine seconds. But I don’t believe them. I was armed with a plan to photographically capture the eclipse in all its magnificence, but this deteriorated quickly when I couldn’t bring myself to look away from its ethereal beauty. After what seemed on the scale of nanoseconds, the sun began to emerge from behind the moon and bathe unsuspecting onlookers with an overwhelming tsunami of light. Indeed, the mysterious midday nightfall and the bright blue arms of the sun’s corona reaching outward toward the universe were among the most hauntingly beautiful things I’ve ever seen. 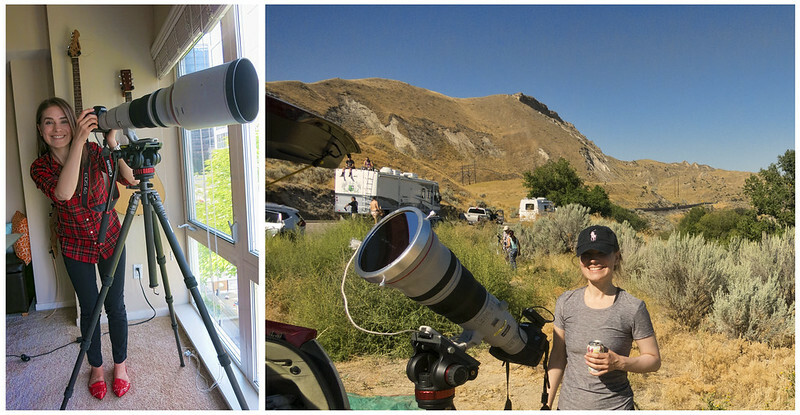 Successfully photographing an eclipse requires considerable planning and attention to detail, as things unfold quite rapidly around totality. Certain aspects of a total solar eclipse happen at fairly precise times, so this part requires planning up front. 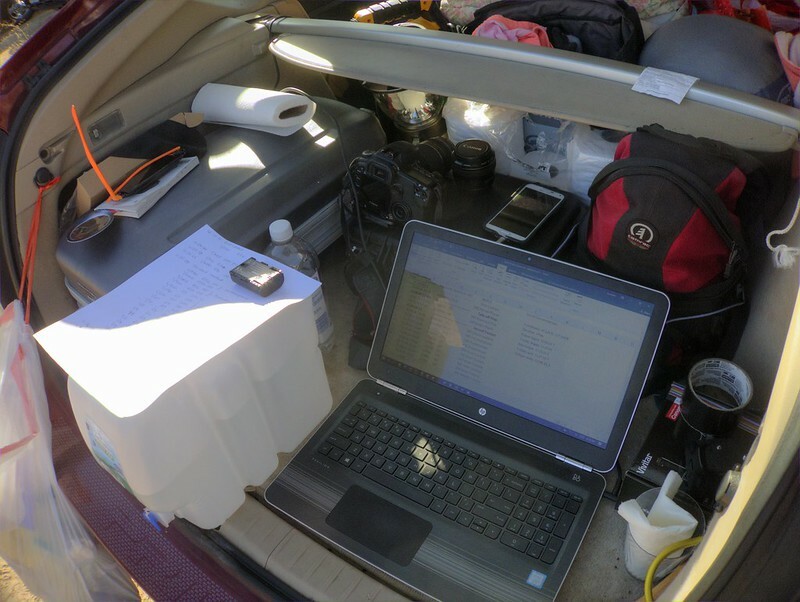 Upon arriving at my location along the Snake River, I punched my GPS coordinates into an eclipse calculator to generate a timetable for the eclipse, most importantly details surrounding totality. I was also armed with a clock synced reasonably well with atomic time, to afford me the precision necessary for some of the shots I wanted to get. 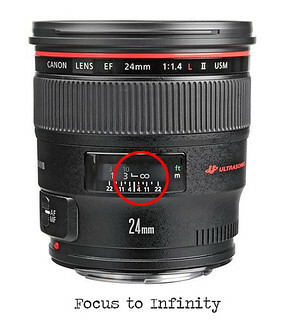 If your lens has a focus indicator that allows you to manually focus to infinity, just set your focus to infinity, and the results will probably be reasonably good. 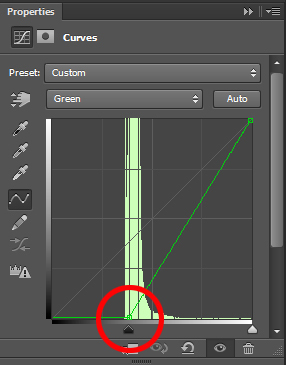 If you happen to be shooting with a camera that has Live View capabilities, as the 6D does, you can turn on Live View, set the magnification to 10x, and choose a part of your scene that is easy to focus on manually (e.g. sunspots). This is what I did. If you have neither of the above options, you can use autofocus and point your camera at something in the landscape located at least 100 yards away, then once you’ve auto-focused, click the lens over the manual focus and don’t touch the focus ring. This is essentially equivalent to focusing to infinity. Partial Phases: these are generally easy to photograph, and I did so with a solar filter at an exposure of 1/2,500, f/5.6 and ISO of 100. Totality: there are a couple of phenomena that occur in the totality and peri-totality timeframe that require precise planning. 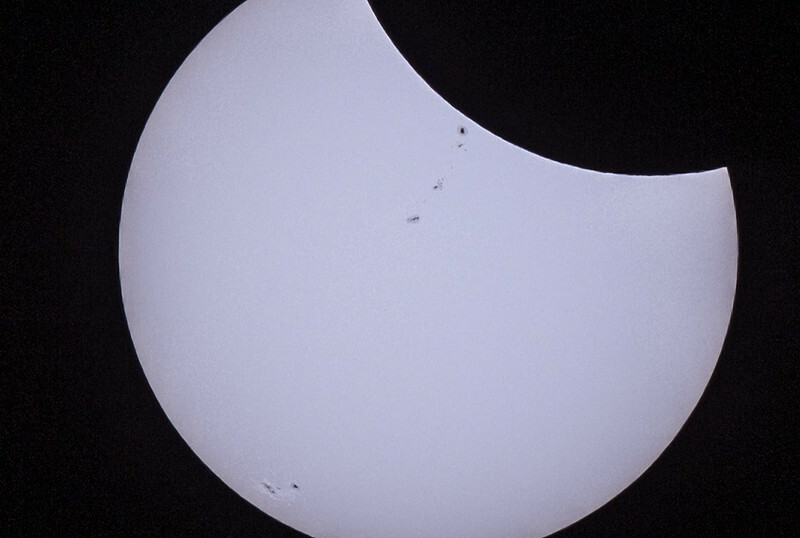 All of these shots are taken without a solar filter, meaning you will remove/replace your solar filter approximately 30 seconds before and after totality. 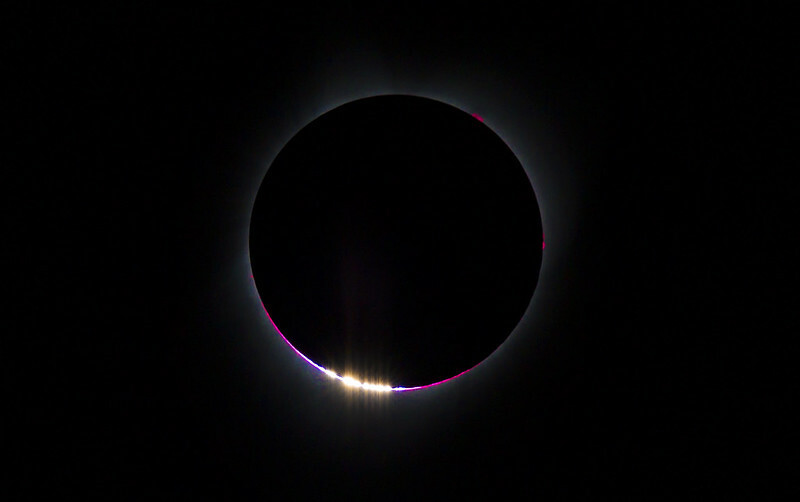 Diamond Ring: this occurs about 10 seconds prior to and following totality. For this shot, I used an exposure of 1/320 sec, f/5.6 and ISO 100. Baily’s Beads: these are created by the last gleam of sunlight shining through the valleys between mountains on the limb of the moon and they appear as little beads of light. 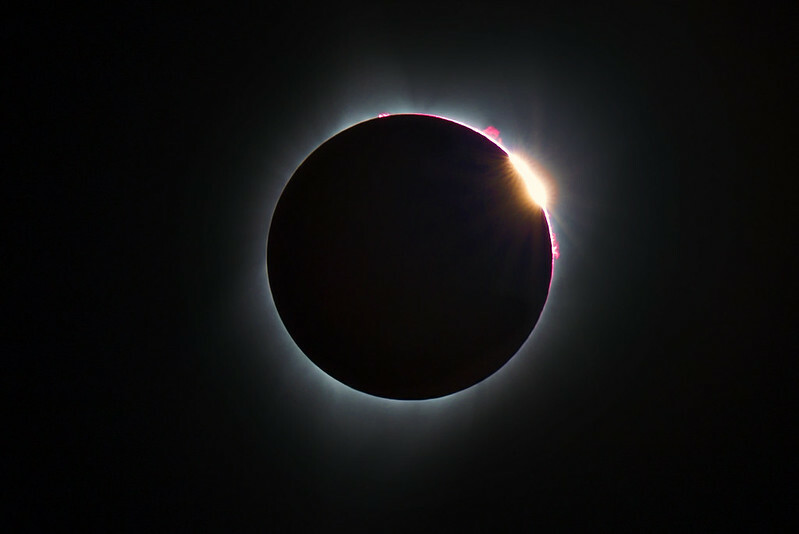 This phenomenon occurs approximately 3 seconds before and after totality, and is generally photographed immediately after/before the Diamond Ring. For this shot, I used 1/4,000 sec exposure, f/5.6 and ISO 100. Chromosphere: this is the part of the sun’s atmosphere that is directly above the photosphere and in images it appears as bright red-pink in color. For this, I used the same settings as for Baily’s Beads. Prominences: These are enormous red-pink plasma ejections along magnetic field lines from the surface of the sun. I captured these again with the range of settings used for Baily’s Beads and the Diamond Ring. 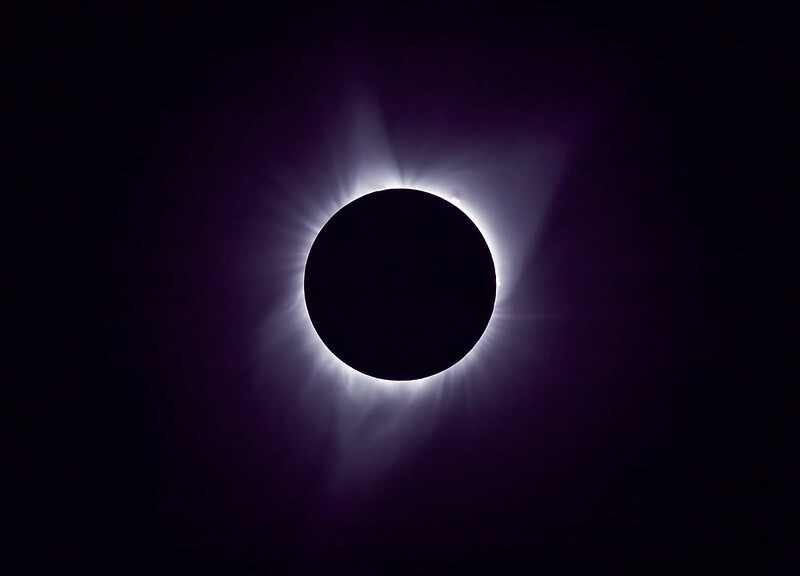 Corona: this is the massive field of plasma ejections extending millions of kilometers from the surface of the sun, responsible for the appearance of blue fire engulfing the moon during totality. 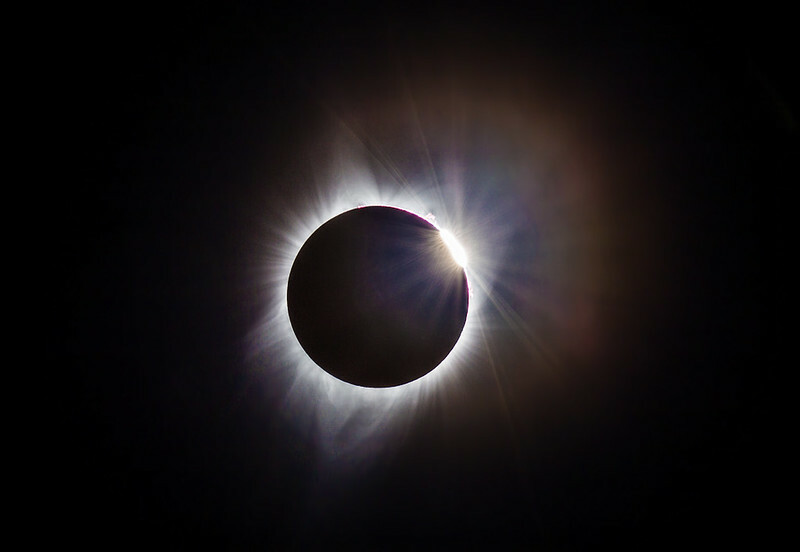 The brightness of the corona is a function of the distance from the sun, so different settings are required to capture different parts of the corona. For example, inner corona can be captured with a rather short exposure because it is quite bright. The middle and outer corona are much more faint and require longer exposures to capture. I successfully captured inner corona, using an exposure of 1/500 sec, with the same settings as above for aperture and ISO. I failed at capturing mid and outer corona because this was the period of time where I just couldn’t stop staring at it long enough to adjust my exposure. I waited 23 years for this eclipse, ever since seeing the annular eclipse of 1994. It was worth every second of the wait. That hypnotic blue fire was otherworldly, mesmerizing and unifying, epitomizing the endlessness and depth of beauty in the universe.